Removes top layers of the epidermis to reveal softer, smoother skin. Eliminates fine lines and improves wrinkles, brown marks and dry spots. Each treatment includes a cleanse, toner, chemical peel to your skin type, cold hammer therapy, customized masque, moisturizer with sunscreen. To keep your skin looking its radiant best, the peel should be repeated once a week or 7-10 days for a series of 6-8 sessions and then periodically thereafter for maintenance. 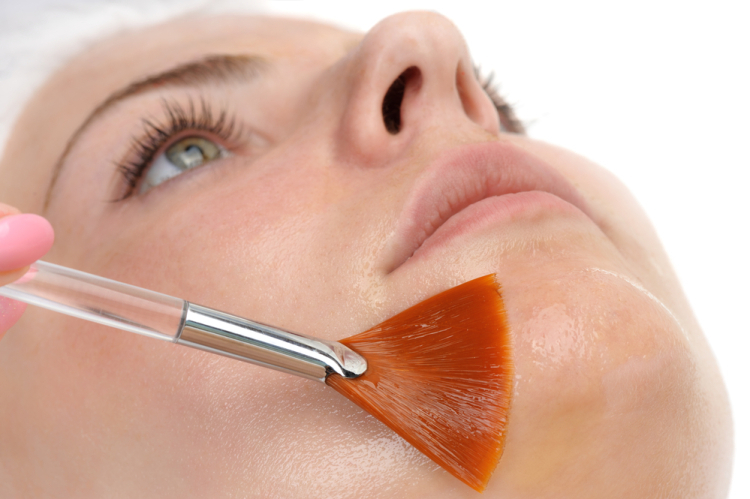 Chemical exfoliation or derma-peeling, is a technique used to improve the appearance of the skin. In this treatment, a chemical solution is applied to the skin, which causes it to "blister" and eventually peel off. The new, regenerated skin is usually smoother and less wrinkled than the old skin. The new skin also is temporarily more sensitive to the sun. What Conditions Do Chemical ExfoliationTreat? Areas of sun damage, which may contain pre-cancerous keratoses that appear as scaly spots, may improve after chemical exfoliation. Following treatment, new pre-cancerous lesions are less likely to appear. However, sags, bulges, and more severe wrinkles do not respond well to chemical peels. They may require other kinds of cosmetic surgical procedures. Who Is A Good Candidate For Chemical Exfoliaton? Generally, fair-skinned and light-haired patients are ideal candidates for this treatment. Darker skin types may also have good results, depending upon the type of problem being treated. However, the risk of an uneven skin tone after the procedure is increased. How Is Chemical Exfoliation performed? The skin is thoroughly cleansed with an agent that removes excess oils and the eyes and hair are protected. One or more chemical solutions, such as glycolic acid or lactic acid are applied to small areas on the skin. These applications produce a controlled wound, enabling new, regenerated skin to appear. Prior to chemical exfoliation, avoid taking Retinol or other similar medications and avoid excessive sun exposure. After the treatment, it's important to use a broad-spectrum sunscreen every day. During a chemical exfoliation most clients experience a burning sensation that lasts about five to ten minutes, followed by a stinging sensation. Cool compresses or fan may be applied to help alleviate this stinging. Depending upon the type of chemical exfoliation, a reaction similar to sunburn occurs following the procedure. It usually involves redness, followed by scaling that ends within three to seven days. Mild peels may be repeated at one to four-week intervals until the desired clinical effect is achieved. I will work with you to determine the depth of your peel. This will depend upon the condition of your skin and the objectives of treatment. It is important to avoid exposure to the sun after a chemical exfoliation since the new skin is fragile and more susceptible to complications. I will prescribe the proper follow-up care to reduce the tendency to develop abnormal skin color after the treatment.